Looky! Looky! Looky! I just love my new lunch box. It has solid metal hinges and a spring clasp lock. The handle is plastic and extends or lays flat. This lunch box is very well made. It also comes in an amazing variety of designs for both boys and girls. When I was a kid, name jewelry was all the rage, but finding something with my name on it wasn’t easy. Charlene is common enough that people don’t marvel over it, but it is uncommon enough that I rarely find it on the store shelf on any of the personalized items. That’s why I fell in love with all of the products at Freckle Box. I got this lunch box so I could be one of the cool kids — albeit belatedly. 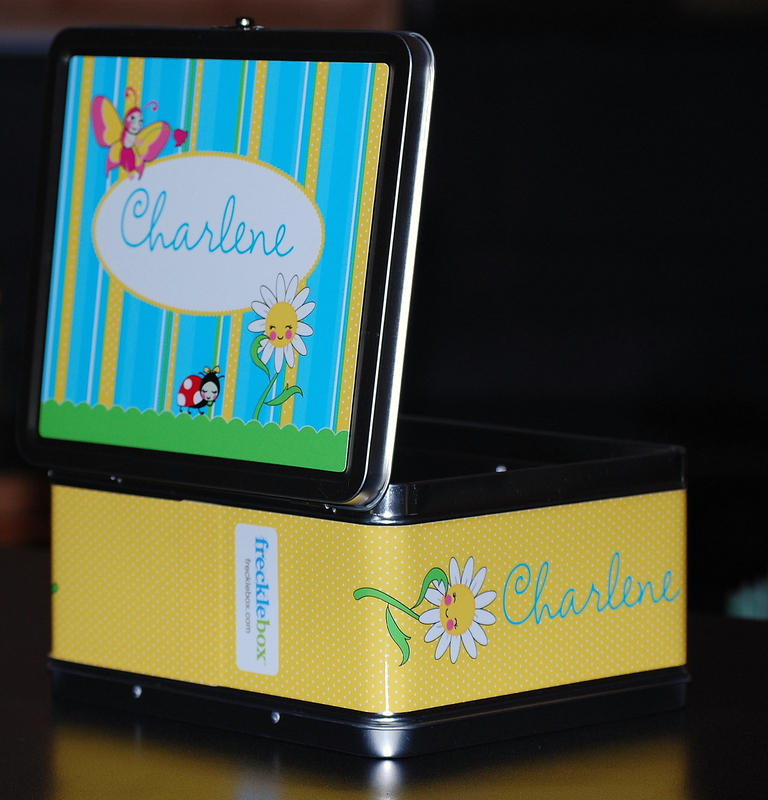 At Freckle Box you can get story books, stickers, journals, notebooks, clipboards and more — all of it personalized. The prices are more than reasonable, too. What kid wouldn’t want to go back to school with this stuff? I have my eye on a personalized clipboard. No teacher has enough of them. I am also eyeballing the personalized journals. I know having a personalized journal makes me more motivated to write. I am thinking it might work on the student’s, too. Phenomenal. I had a Evel Knieval and an X-men. My brother had an Incredible Hulk which was awesome! With a name like Kelley, with the extra e, I feel your pain! My class took a field trip to the Crayola factory where EVERY ONE else got stickers with their names. I had to settle for “LOVE”…ick! 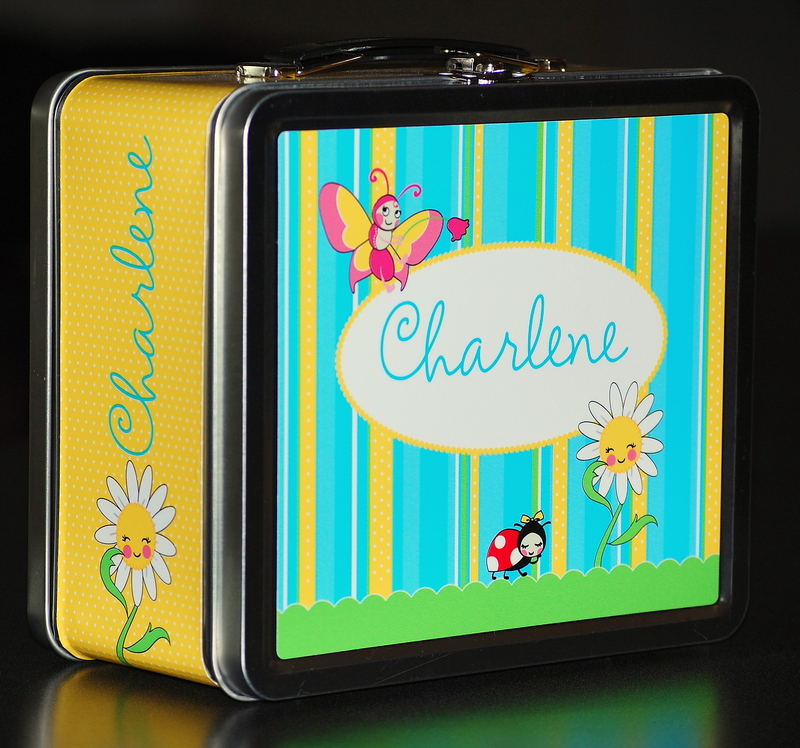 I love this lunch box! Does it pack itself too? I might just be head over heels! I love it!!! If this is open to Canadians (I didn’t see requirements) than consider this my entry. My favourite is the Hula Boy lunchbox. Now I know it says Hula BOY but I love the colours of it anyway haha! It’d be perfect for bringing my lunches to work!!! In my school days I never had the name stuff either, I could always find my name but there was no way my parents would pay more just for my name on something when I could write it on myself haha! I’m back! If I win, I would get the Jumpy Joe notebok. If that cute frog doesn’t inspire writing, I don’t know what does! For my writing group I’m supposed to have a notebook in which I record the important points from the critique session. At least if they hate my story the frog would cheer me up! Thanks for thinking of us, Quilly! Your lunch box is so cute. They have really neat place mats. That is so darling! I’m certainly going to have to check that out. I definitely want to be the “cool one” in the lunch room at school! 😀 I’ll be back after I’ve had a chance to check things out on the website. Thom — I really wanted to see you with a lunch box bearing your name. You could take it to work with you. I would randomly win the “Walk the Plank” Pirate Puzzle because Sunday September 19th is International Talk Like A Pirate Day. Karen — sorry you didn’t win this one, but hooray, you won the other! Karen — shur ‘nuf you always seem to miss the good stuff.